Charlottesville, Va. – Virginia athletics director Carla Williams announced today (April 16) Tina Thompson as head coach of the Cavaliers’ women’s basketball program. Thompson comes to Virginia after serving on the coaching staff at Texas the past three seasons. Prior to entering the coaching profession, Thompson had a college and professional career that gained her entry into the Naismith Memorial Basketball Hall of Fame as a member of the 2018 induction class. Thompson’s background is one of the most impressive in the history of women’s basketball. 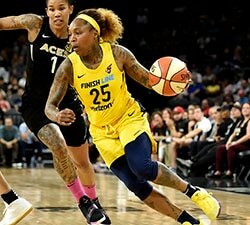 She retired as the all-time leading scorer in WNBA history, a two-time Olympic gold medalist, a four-time WNBA champion and was the first player drafted in the history of the WNBA. Thompson becomes the fifth head coach in UVA’s 44-year history. “I am thrilled to have Tina Thompson as our new women’s basketball coach,” Williams said. “She is one of the best to ever play the game and she has experienced tremendous success at all levels of the game. I am looking forward to working with her and supporting her vision for Virginia basketball. Thompson joined Karen Aston’s staff at Texas in May of 2015 as an assistant coach. She was promoted to associate head coach last September. During her tenure at Texas, she focused on the development of the Longhorns’ post players. Texas recorded a 28-7 record in 2017-18, reaching NCAA Sweet 16 in Kansas City. The Longhorns went 84-21 (.800) during her three seasons in Austin. The 2016-17 Texas team reached the Sweet 16 of the NCAA Tournament and the 2015-16 squad compiled a 31-5 mark on the way to a NCAA Elite Eight appearance. “I am extremely excited about the opportunity to become the next women’s basketball coach at the University of Virginia,” Thompson said. “I am grateful for the opportunity to lead a program with such a rich history. This program is in an exciting place with a hardworking group of young ladies. It is my intention to continue the winning ways coach Joanne Boyle has built with this impressionable group. “My sentiments mirror that of my 12-year-old son Dyllan. When I told him the great news he said, `Wait! Mom are you kidding? I mean wow. Isn’t that a good program? Correction. Great program! I am so happy for you. We will do great things there!’ My response to him was that I could not agree more! I am excited about meeting my team, getting to know them and pouring into them. 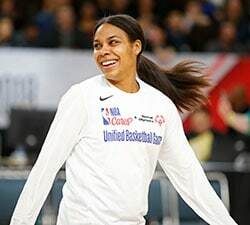 Thompson arrived at Texas after a trailblazing career in the WNBA, in which she began as the first overall draft pick in 1997 and ended as the league’s all-time leading scorer in 2013. Throughout her 17-year professional playing career, Thompson was a four-time WNBA champion with the Houston Comets (1997, 1998, 1999, 2000), a member of the WNBA All-Decade team, an eight-time All-WNBA team selection, a nine-time WNBA All-Star and the WNBA All-Star MVP in 2000. After 12 seasons in Houston, the Los Angeles native returned to her hometown in 2009 as a member of the Los Angeles Sparks. 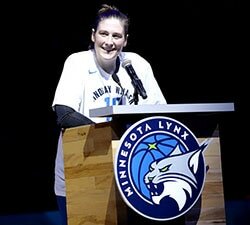 She became the WNBA’s all-time leading scorer on August 8, 2010, scoring her 6,264th career point to pass Lisa Leslie — a former teammate of Thompson’s at the high school, college and professional levels. 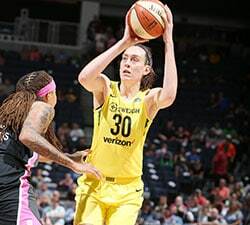 Thompson ended her professional career with the Seattle Storm in 2013 as the league’s all-time leading scorer with 7,488 points in 496 games played (15.1 ppg). On the international level, Thompson has won two Olympic Gold Medals as a member of Team USA in 2004 (Athens) and 2008 (Beijing). She has also participated in other professional leagues overseas. Following the 2001 WNBA season, she played for Rovereto Basket in Italy and in 2003 she joined the Kumho Falcons of the Women’s Korea Basketball League (WKBL). In 2006 and 2007, she played for Spartak Moscow Region (Euro league) and in 2010 for the MCM TÃ¢rgoviÅ?te in Romania. In her first year in Austin, Thompson was heavily involved in the development of senior center Imani Boyette, who earned honorable mention All-America honors from both the Associated Press and the Women’s Basketball Coaches Association. In 2015-16, Boyette became the first player in program history to reach the combined milestone of 1,000 career points, 1,000 career rebounds and 200 career blocks. Boyette was the fourth player in school history to be drafted in the first round of the WNBA Draft, going to the Chicago Sky with the 10th overall pick in 2016. Thompson was also responsible for the development of Kelsey Lang who was a 2016-17 All-Big 12 Honorable Mention selection, earned CoSIDA Academic All-District honoree and top-30 finalist for the prestigious Senior CLASS Award. Lang finished her UT career fifth all-time in games played (138), sixth in blocked shots (190) and 36th in scoring (1,086). In 2018, Texas saw Ariel Atkins taken as the No. 7 selection by the Washington Mystics during the WNBA Draft. Thompson played collegiately at the University of Southern California (1993-1997) where she helped USC compile a 77-37 record and three NCAA tournament appearances (1994, 1995, 1997), including an Elite Eight appearance in 1994. A three-time All-Pac 10 selection at USC, Thompson was a second-team All-American as a senior in 1997. She finished fifth on USC’s career lists in scoring (2,248 points) and (1,168 rebounds). Thompson graduated from USC in 1997 with a degree in sociology and a minor in psychology. Thompson was born in Los Angeles as one of five siblings — and has two brothers and two sisters. She has one son, Dyllan, who was born in 2005. Thompson’s enshrinement ceremony for the 2018 Naismith Memorial Basketball Hall of Fame will take place on Friday, September 7 at 6:30 p.m. at the Springfield Symphony Hall in Springfield, Mass.